The digital age has made us impatient. As content consumers we want to see everything—we want it now, we want it on every device, and we want it to be engaging enough to hold our attention until the next thing comes along in our newsfeed. But don’t feel bad; it’s not your fault. The evolution of digital content production and distribution has flooded nearly every channel of our lives and changed the rules for brands and consumers alike. The speed at which the Internet moves today can make content obsolete—sometimes nearly instantaneously. Brands are required to maintain a feverish pace to keep up with competitors in search, the demands of consumers and trending topics that span across the depths of the Twittersphere. Additionally, over the last few years, consumers have made a shift in preference towards more visual and stimulating content. So how can brands respond to create timely and relevant content that increases visibility and drives users to take action? The answer is, it can’t be done alone. Digital trend drivers, like Google, understand this shift in content consumption and have developed new services to provide users with instant gratification, relevant content and engaging mediums directly in search. Features such as Universal Search and Entity Search offer immediate content solutions without the need for consumers to dig for information or even finish typing their search query. To provide users with the instant gratification they crave, leverage these search tools to increase the exposure of your brand’s most engaging digital assets. 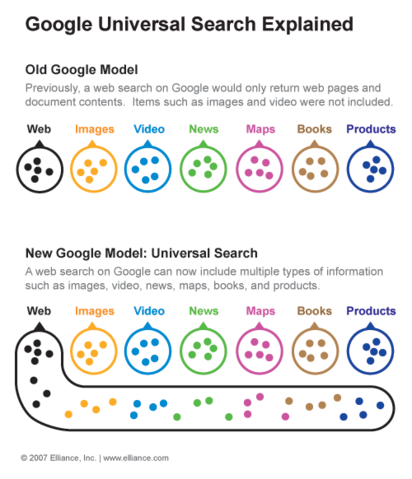 Google’s Entity Search is a major visual component of its recent Knowledge Graph effort, which helps improve a user’s search experience through quick and easy discovery. Entity Search provides users with helpful information in panels located directly on SERPs, limiting the need for users to dig through organic and paid listings to find answers. Almost two years ago, Google rolled out this new feature to increase relevancy and build connections by what words mean based on user intent. Today, Entity Search offers even more insights and continues to create a search experience that delivers instant gratification. Recently, it has evolved to create a more personalized and interactive experience based on a user’s connections from Gmail and social accounts. Users today may see information such as travel plans pulled from their Google account directly into search, which creates a more relevant and valuable experience when searching around related topics or activities like trying to find a hotel. As you can see from the example above, the left side appears as the normal Google search result page, while the right contains the Knowledge Graph update. The shift toward instant gratification may provide obstacles for brands looking to improve visibility through paid advertising and search engine optimization, but it also offers opportunities to create content that supports and expands upon information within Entity Search panels. Complement direct answer panels and personalized results with search optimized content that expands upon the user’s intent and fills a need. The biggest opportunity for brands is to create a strong presence for branded phrases and own the panel for your brand. To ensure your brand’s Entity Search presence is as robust as possible, create a strong search presence, link social media accounts, update local information, upload photos to Google + and stay active across all digital channels. A strong Entity Search presence paired with organic and paid listings can create a powerful brand presence. Unfortunately, there is no way to ensure your content will appear in Entity Search, especially for queries outside your brand. Getting content to appear in non-branded searches is no easy task and requires a strong search presence and a good bit of luck. The best practice is to produce great content that is well optimized for search and offers quick and simple value to users, but understand that the odds are against you. Google introduced Universal Search to enrich the search experience for users by optimizing content such as images, video, news, shopping, maps/local to appear directly in search results. Google chooses what content to rank in Universal Search SERPs by analyzing the most popular types of content chosen by users in that query space. Identify opportunities to get your content ranked in Universal Search with two methods. The best opportunity is to explore historical search data to find SERPs that previously included Universal Search data but currently do not. A lack of Universal Search content being indexed signifies that content currently offered does not offer value to users. Producing content that fills the need of users, is relevant to intent of the users search, and is optimized for those keyword phrases provides a good opportunity to get listed on SERPs. The second method is to trigger entry of Universal Search elements into results by producing unique and quality content for targeted keyword phrases. This approach is more difficult without any historical data to rely on, so pay attention to query type triggers and content trends in search. To increase the likelihood of your content appearing in Universal Search, craft your content to match the intent of the users search, generate engagement across various channels, and optimize your content for targeted keywords used by your target audience segments that currently lack a Universal Search presence. The instant gratification of relevant and engaging content drives consumer demand. Increase your contents effectiveness by leveraging online tools to expand accessibility and developing a strong content marketing strategy targeted around the unique needs and online behaviors of your target audience segments.